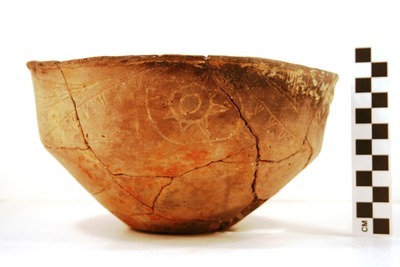 "41CP12, Burial 6, Pot 8" by Timothy K. Perttula and Robert Z. Selden Jr.
DECORATION: The rim has an engraved circle and nested triangle motif repeated four times on the vessel. Each of the large circles (either within the nested triangle or between the nested triangles) have smaller circles within them, with small triangles and hatched triangles pendant from the outermost circle. The nested triangles have small hatched pendant triangles. There are also sets of hatched triangular elements between the nested triangles and large circles. Ripley Engraved, var. Cash carinated bowl, Burial 6, Pot 8.